The European Union launched Operation Sophia in 2015 to crack down on smugglers on the high seas, after hundreds of migrants died when their rickety boats sank off southern Italy. 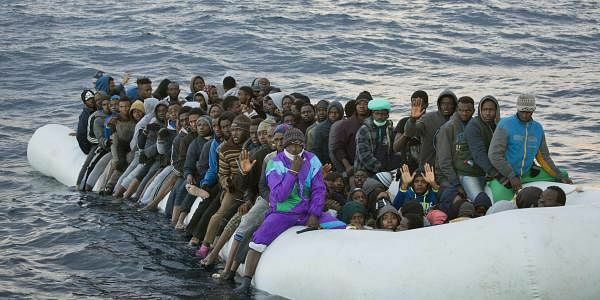 WARSAW: Libyan Foreign Minister Mohamad Taher Siala on Friday urged the EU to rethink its naval operation in the Mediterranean, saying it comes with the side effect of encouraging migrants to attempt the perilous crossing to Europe. The operation's vessels are charged with intercepting smugglers' boats and destroying them, but they often end up rescuing the migrants trying to make their way to Europe -- many of whom depart from Libya. "I think this Sophia operation, it's negative. It's not positive. Simply because in part they encourage the migration," Taher Siala told AFP in an interview in Warsaw, where he met with his Polish counterpart. Six years since a revolution that toppled dictator Moamer Kadhafi, Libya has become a key departure point for migrants risking their lives to cross the Mediterranean to Europe. Migrants "used to calculate the whole risk, till they reach Lampedusa or Pantelleria in Italy," Taher Siala said, referring to two islands that have become migrant hubs. "Now they are only calculating the risk of how they cross Libya and then go outside the Libyan territorial waters," he added. "Because then they are picked up by the vessels, they take them to Europe, safely. So I think they have to rethink this operation." But Fabrice Leggeri, the head of EU border agency Frontex partly in charge of Operation Sophia, has criticised charities that rescue migrants off Libya, arguing that they are responsible for encouraging traffickers. Hailing mainly from sub-Saharan countries, most of the migrants board boats operated by people traffickers in the country's west, heading for the Italian island of Lampedusa 300 kilometres (190 miles) away. Concern has shifted to this central Mediterranean smuggling route and away from the Aegean route since a 2016 EU-Turkey deal to stop migrant flows slashed the number of people landing in Greece after fleeing war and persecution in the Middle East. Unlike Syrians, most travelling from Libya are deemed illegal economic migrants who are seeking jobs rather than fleeing war and persecution. They are usually deported. Taher Siala said that "development in the (migrants') source countries and good control of the borders and some development within Libya" could stem the human tide heading north. "But if you just continue taking them and then returning them... you cannot limit the migration like that. You have to stop them from coming to Libya first," he added. "And you know that summer is coming, the sea will not be rough as it is now, and then I think the number maybe (will) increase."